The Colt 1911 is probably the most iconic pistol of the 20th century. I will not go into great detail about the history and the legacy left by this grand old pistol, just suffice to say that it has paid its dues numerous times over. It is an exceedingly popular pistol in several shapes, styles, and sizes. It can also be chambered in a myriad of calibers ranging from .17 to .50. Despite the various configurations that the 1911 can come in, it is a safe bet that the most common is the 5” barrel chambered in .45 ACP. The .45 ACP, while not a wrist breaker, is a stout cartridge that can generate a quite a bit of recoil in its hotter loadings. It is also a little pricey. Both of these factors can make a range session rather difficult to enjoy and harder for the new shooter to become proficient with their pistol. If only there was a solution. The Kimber Rimfire Target Conversion Kit is a complete kit that contains the 22LR conversion slide, barrel, recoil spring assembly, and one 10 round magazine. The kit mounts to the frame of your existing 1911 single stack with standard length frame and converts it to fire .22LR. You use the same trigger, grips, safeties, and hammer. 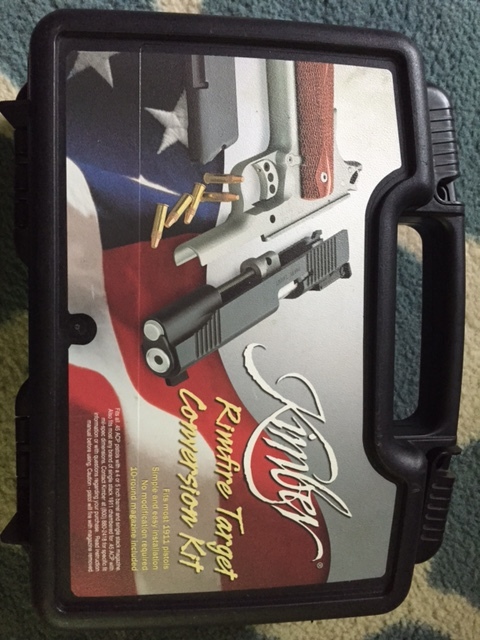 This kit retails for $339 and since it is not a firearm, can be shipped to your door. My first thought upon inspecting the slide assembly was how light it was. And rightfully so, it cycles on blowback operation with the 1911’s standard hammer spring, so it has to be light to overcome the resistance. The slide appears to be made from an aluminum alloy and is painted black, as I later found. The ramped barrel is stainless steel and has a target crown. The slide comes with adjustable target-style sights that seem to hold up well to repeated use. It also has an external extractor and a long ejector that is pinned to the barrel in order to more positively grab those pesky .22 shells that can swell and crack in a chamber all to easily. The slide has forward and rear serrations that are similar to what is on the company’s .45 version of the pistol, but that serve no use, as the resistance required to pull back the slide is nil. The magazine is made of plastic and has a cutaway portion to show the number of rounds still in the chamber. The assembly has a mixture of the old bushing system and the newer guide rod system amalgamated together. This allows for the whole kit to be completely assembled in one piece while mounting to the frame of the host pistol. The biggest “issues” I have with this whole kit is that Kimber recommends using only high velocity .22 ammo to ensure reliable cycling, and that the slide does NOT lock back on the empty magazine. Converting your standard 1911 over to the .22 conversion kit is very simple and straight forward. Simply field strip your 1911 as if for cleaning. I won’t go into that process because disassembly on 1911’s that have a bushing or guide rod system will vary. Mount the complete and assembled slide assembly to the rails of the frame and insert the pistol’s original retaining pin in the hole in the frame and Viola! You now have a .22 caliber 1911. You can now train with your pistol and work on areas such as grip and trigger squeeze without having to worry about pain in your wrist and in your wallet. 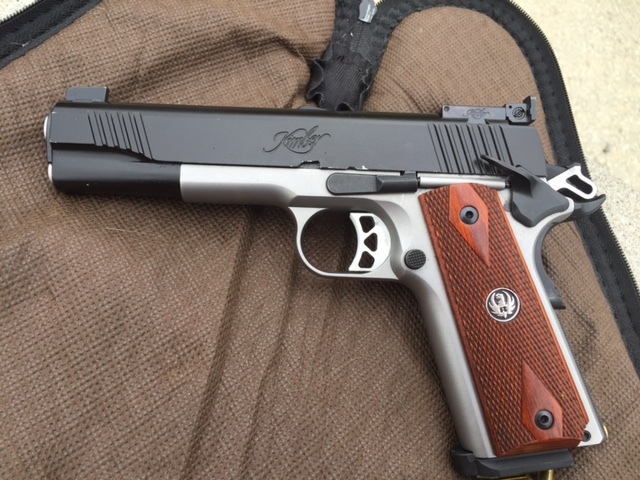 I mounted the kit on two different 1911-style pistols for comparison sakes: a High Standard GI .45 with a 5 inch barrel that has sloppy tolerances, and a Ruger SR1911 CMD that is an absolute dream to shoot and is as tight as a pin hole. Once I mounted the kit on both pistols I was amazed at how good they both looked with the conversion slide mounted on. They looked like a real Kimber Target .45 that cost five times as much. One thing is for certain, this is a handsome, well fitting conversion kit. Mounting on the GI was very easy and it shot ok, nothing to write home about. Mounting the kit on the Ruger was a bit more difficult. The tolerances are waaayyy tighter and could definitely be determined while shooting and cycling the firearm. However, it shot very tight groups with all the .22 ammo I fed it. I think that this is a valid point to make because of the wide variances in 1911-style pistols out there, from 400 dollar Tisa’s to an Ed Brown ,you will probably have different experiences than I do. In fact I almost guarantee it. I tested several brands of high velocity, and standard velocity 22 ammo. I also plinked about 500 rounds out of it at various targets and distances to see how well it could run. I had about the same amount of reliability either way. About one out of every 75 rounds would fail to cycle the slide all the way back, or would stove pipe. Is that any better or worse than a dedicated .22 pistol? I don’t think so. When I shot this pistol for testing I shot from 25 yards, and used 5 shot groups. The ammo I used for accuracy testing was Federal High Velocity, which is a 36 grain hollow point advertised as 1260 fps out of a rifle. My chronograph measured the velocity of the round at an average of 1089, with a low of 1032, and a high of 1115 fps. That’s not bad at all for .22LR out of a pistol. From the rest I could eek out 2.2 inch groups with the Federal Ammo. This slide is definitely a shooter, at least from my Ruger. The GI Model was consistently producing clay target accuracy with all brands of ammo. I attribute that to the sloppier tolerances and rougher trigger. I have to say that I really like this kit. Is it perfect? No. Does it fit the bill for every circumstance that is required of a 22 pistol? No. Does it work within the confines of its design and intent? Yeah. This is a great tool for sharpening your skills on your 1911 without breaking the bank. It is also a great tool for introducing new shooters to the 1911 format. Is it a great hunting or packing .22? Not in my mind, no. But for training, target practice, and platform familiarity this is about as perfect as it can be.